Managing organizational culture is getting harder as the alternative workforce continues to rise. While it may be difficult to define and tricky to manage, it can have a powerful impact on individual and corporate performance. Research shows that organizations that cultivate a positive culture around a set of shared values have an advantage over competitors: Workers who perceive their very human need for meaning and purpose as being met at work exhibit higher levels of performance and put in greater discretionary effort. Beyond simply work output, culture is also a powerful driver of engagement, which has been linked to better financial performance. This is why, at many organizations, leaders strive to deliberately shape a culture that encourages employee effort and collaboration around a shared set of values. Figure 1 shows how the workforce can be segmented along two axes: location – on- vs. off-campus – and contract type – on- vs. off-balance sheet. Considered in this way, the workforce broadly falls into four segments, each presenting distinct challenges with regard to propagating organizational culture. Note that these axes are fluid in nature; in particular, many workers in certain industries, such as professional services, may split their time between off- and on-campus locations (indicated by the gradient area in figure 1). 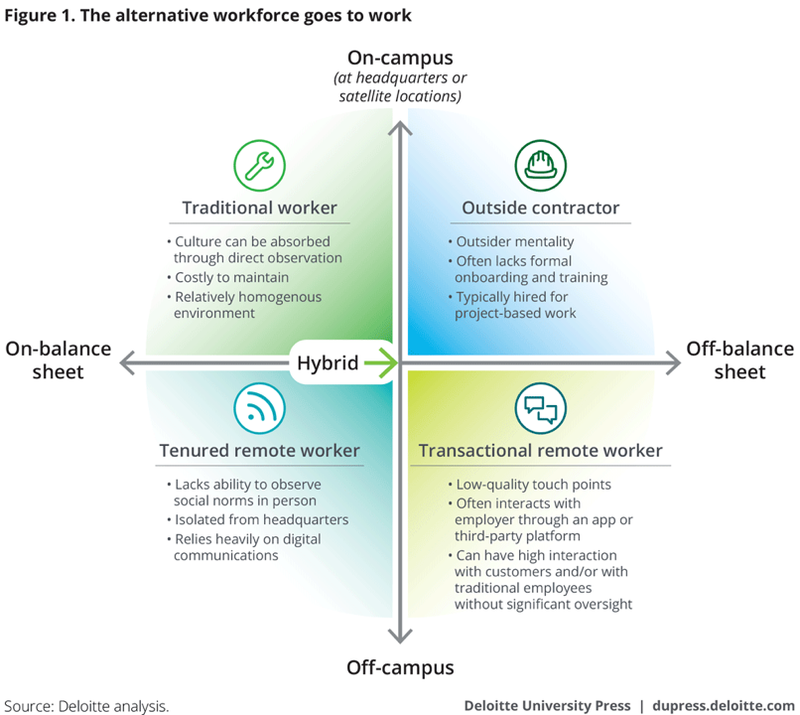 These workers may be considered “hybrid” workers who experience some of the cultural advantages of on-campus work, while also facing some of the challenges experienced by the remote worker. Off-campus but on-balance sheet workers are commonly referred to as teleworkers, but they may also include traveling salespeople, remote customer service workers, and those in other jobs that do not require on-campus accommodations. These workers have flexibility of location, but are at a disadvantage when it comes to actually observing social norms as well as experiencing in-person collaboration. Research suggests that remote employees often have less trust in each other’s work and capabilities due to a lack of interpersonal communication. 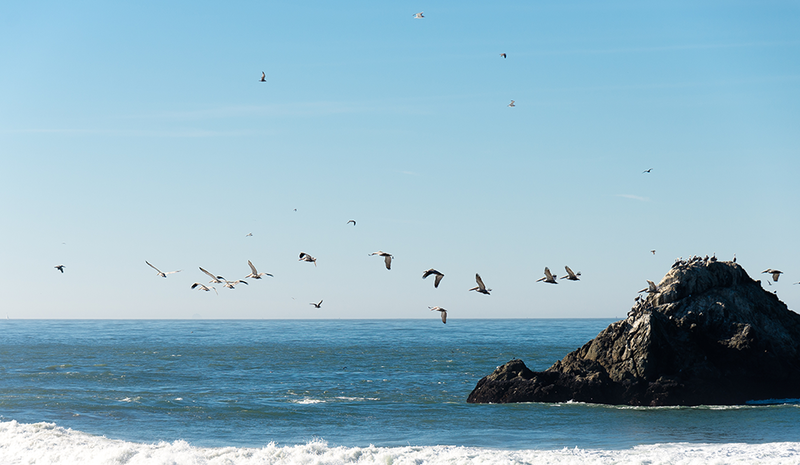 In addition, remote workers may feel isolated and separated from the company’s headquarters. However, companies still have some traditional levers to pull to engage the tenured remote worker, such as benefits and formal career progression opportunities. This type of worker is not only off-balance sheet, but also off-campus. Often, they are paid to deliver very specific services. Many of these individuals operate on flexible schedules and in customer-facing roles. Their relationship with the hiring organization can be marked by low-quality touchpoints and facilitated through technology-based platforms or a third-party agency. The transactional remote worker may also experience a strong sense of instability, which may result in added anxiety. On-campus but off-balance-sheet, contract or consulting workers often bring an inherent outsider mentality and an array of previous cultural experiences. They are often brought in to help facilitate a shorter-term or finite project and may be viewed – or may view themselves – as not being subject to the organization’s cultural norms and values. These workers usually do not receive the typical onboarding and new hire training opportunities that can help build a sense of culture among on-balance sheet employees. Given that these individuals work on campus and can observe the organization’s norms firsthand, however, there may be more opportunities to make them feel like part of the culture. An organization’s culture can help boost its performance – but to deliver its full potential, culture should extend to all types of workers, not just traditional employees. Given the current and anticipated growth in the off-balance sheet workforce and in the number of individuals working off-campus, leaders should think about how they can include these workers in their efforts to create and sustain a positive organizational culture. Sonny Chheng, principal, Deloitte Consulting LLP. Kelly Monahan, manager, Deloitte Services LP. Karen Reid, manager, Deloitte Consulting LLP. Deloitte refers to one or more of Deloitte Touche Tohmatsu Limited, a U.K. private company limited by guarantee (“DTTL”), its network of member firms, and their related entities. DTTL and each of its member firms are legally separate and independent entities. DTTL (also referred to as “Deloitte Global”) does not provide services to clients. In the United States, Deloitte refers to one or more of the U.S. member firms of DTTL, their related entities that operate using the “Deloitte” name in the United States, and their respective affiliates. Certain services may not be available to attest clients under the rules and regulations of public accounting. Please see www.deloitte.com/about to learn more about our global network of member firms. Sonny Chheng is principal at Deloitte Consulting LLP. Kelly Monahan is manager at Deloitte Services LP. Karen Reid is manager at Deloitte Consulting LLP.